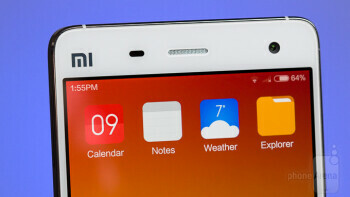 The first ever Xiaomi product wasn't a hardware one – it was software. We're, of course, referring to the company's wildly-popular custom Android skin, MIUI (pronounced “Me You I”), which is available for a staggering amount of non-Xiaomi devices, too, including major competitors such as Samsung, HTC, LG, and so on. Our own Mi 4 makes use of the latest major iteration of MIUI – V6, based on Android 4.4.4 KitKat – and is likely one of the best executed manufacturer Android skins out there. MIUI 6 is light, but feature-filled, and though it is heavily-inspired by Apple's iOS design-wise, it is still stunningly-beautiful. Everything, from the Calculator, through the Compass and Clock apps, down to the various animations that follow you when navigating the UI – all have been designed within a framework that puts emphasis on both aesthetics and function. Perhaps the first thing newcomers are bound to notice with MIUI is the lack of an app drawer – all your icons are stored on your homscreens, of which you can have as many or as little as you want. The notification panel, which you can call up by simply swiping down anywhere on the homscreen, is also smarter than on stock Android – for example, whenever you have no “priority” notifications, you'll be redirected straight to the toggles pane, and vice-versa. By priority we mean stuff other than app updates – like a missed call or a new Viber or Facebook message. Another useful feature of MIUI is the included Themes app, which is hooked up to Xiaomi's servers. You can browse through thousands of different free and paid themes that change the look and feel of your Mi 4 from the ground-up, but do prepare yourself for an onslaught of Chinese characters – there's as of yet no translation for the store. We can't possibly go through all the remaining features, but we'll mention one more – unlike the Mi 3, the Mi 4 has no dedicated “gloves mode”. Instead, the screen will always register your touches even if you're gloved – you no longer need to fiddle with the settings. In its short history, Xiaomi has never once dropped the ball with performance – its devices have consistently conducted themselves greatly. 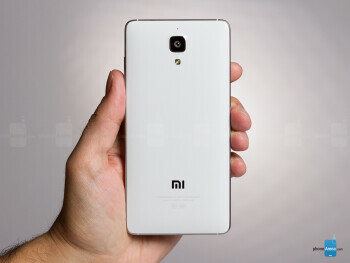 This is, in part, thanks to the software, but also due to the high-end hardware Xiaomi typically makes use of. 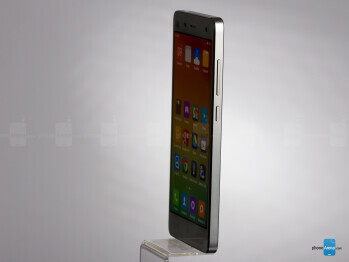 The Mi 4 is no exception. Powered by a potent quad-core Snapdragon 801 with four Krait 400 cores ticking at 2.5GHz and an Adreno 330 GPU, along with 3 gigs of RAM, this _phone_ is no slouch – and it shows. Whether we're talking about general navigation throughout the interface or playing Asphalt 8-level graphics-intensive games, it's fair to say that the Mi 4 delivers. But there's a caveat that's worth talking about. The Mi 4 has two distinct performance “modes” available through the Battery menu – “Balanced” (default) and “Performance”. It shouldn't be too hard to guess what the idea behind either is – the former is more conservative and puts a cap on the maximum achievable clock speeds of the processor's cores in order to conserve battery, while the latter allows it to go all out. We ran our usual suite of performance benchmarks with both modes on (the ones you're seeing below are for the default “Balanced” mode), and the differences in performance are there – when left to go full out, the Mi 4 lands among the best we've tested. Otherwise, it is quite ordinary with its scores. Finally, in terms of storage, the Mi 4 comes in two flavors – a 16GB and 64GB one. If you're hoping that you can build on top of that, however, you'll be disappointed to hear that no microSD slot is to be found on board Xiaomi's latest. Built into the MIUI software is a default Browser that is a decent performer. Heavier pages aren't handled as well as with Chrome, but those are becoming more and more rare on mobile, so most of the time you're getting a smooth experience. We still prefer Chrome as it's an all-around better performer and can sync with its desktop counterpart, but some of you might want to stick with the default solution due its extended functionality set. So, what have we got here? Well, for starters, we've got a dedicated reader mode that does away with images so that you can focus on the message with no distractions. There's also a night mode which switches the theme to a dark one – handy when browsing in bed. Also available is an ad/pop-ups blocker, along with a feature that allows you to save some of your monthly data allowance by compressing data. On the hardware side of the connectivity equation, we've got Bluetooth 4.0, 5GHz Wi-Fi, support for MHL, and an infrared blaster that can be used as a remote for pretty much all your home electronics that work with one. There's no NFC chip found on board, by the way – according to Xiaomi, just 1% of the user base actually ever used it, so it failed to make the shortlist this time around. Unfortunately, LTE is also missing on our version of the Mi 4 – that perk is currently reserved for a different version of the Mi 4 that won't work with most carriers around the globe. 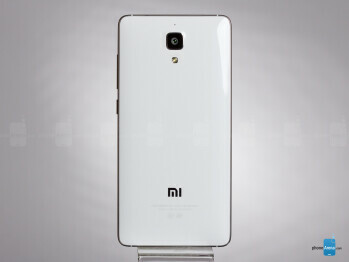 A 6 lens, Sony-made Exmor RS sensor (IMX214) is what Xiaomi chose for the Mi 4's rear camera slot – a popular choice among flagship-level devices as of late. That's understandable, though: the 13-megapixel, 1/3.06” sensor has a very wide, f/1.8 aperture lens and offers extremely quick auto focus (less than a third of a second). At the front, we're looking at an equally impressive-sounding, 8-megapixel, 5-lens Sony Exmor R sensor (IMX219, we suspect) with f/1.8 aperture. On the software side, we've got the functional MIUI camera, which is logically-consistent and offers a fairly standard layout. You can slide left and right to access the different filters (some of which are actually uncommon and cool) and shooting modes. All sounds great so far, but what do the actual snaps the two cameras produce look like? Overall, the results are up to snuff for this category, but not quite as good as what the best cameraphones on the market have to offer. Snaps can look pretty great, but often they have drawbacks, such as visible vignetting and Sony-like blurring towards the edges of the frame. Regardless, daytime outdoor snaps are properly exposed and natural-looking on the whole, even if they're a bit warmer than optimal. 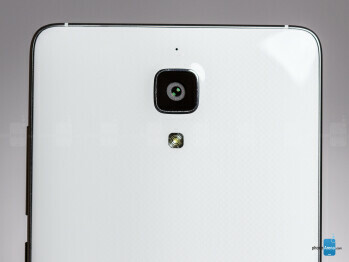 Thankfully for Xiaomi, the effect isn't at all severe – it's actually flattering. As for details, the fine print here needs to be read out aloud, as even though you do get a very healthy amounts of fine information, the aforementioned issue with blur negatively impacts this particular metric. There's definitely room for improvement here. As for indoor shots in medium-lit environments, we quite liked what the Mi 4 has to offer – stills are excellent in terms of both color reproduction and exposure. Unfortunately, blur still rears its ugly head, and we quickly found that we're better off manually setting focus every time in order to compensate for this issue. Scenarios where light was on the low side turned out equally favorable for the Mi 4, though the flash is on the weaker side and images are typically cold with muted colors when it kicks in – alike to most smartphones on the market right now. Night shots are also nothing to write home about – the special Handheld Twilight mode helps a tad by making details previously veiled in darkness a bit more visible, but that does come at the expense of noise. Looking at the stills produced by the front-facing camera, we've got to say that this is among the best we've seen, though still not as good as the king of them all – the selfie snapper of the Huawei Ascend P7. Regardless, images come out with a wealth of detail and both exposure and color reproduction are satisfactory. Still, don't go comparing the unit with the likes of the iPhone 6, for example – it's still a tiny front-facing camera, after all. Turning to special modes, we'll start off by venting off our displeasure with panoramas – for whatever reason, the software limits those to something ridiculously low, like 4MP. Hopefully, Xiaomi will address this in a future software update of MIUI. Moving onto HDR, the situation here is admittedly a bit odd. There are two distinct HDR modes available – Normal and Live – and they function quite differently from each other. The former is more like what you'd expect from the mode, and while snaps end up being a tad artificial-looking, we'll confess that we nevertheless like the extremely dynamic stills that it produces. 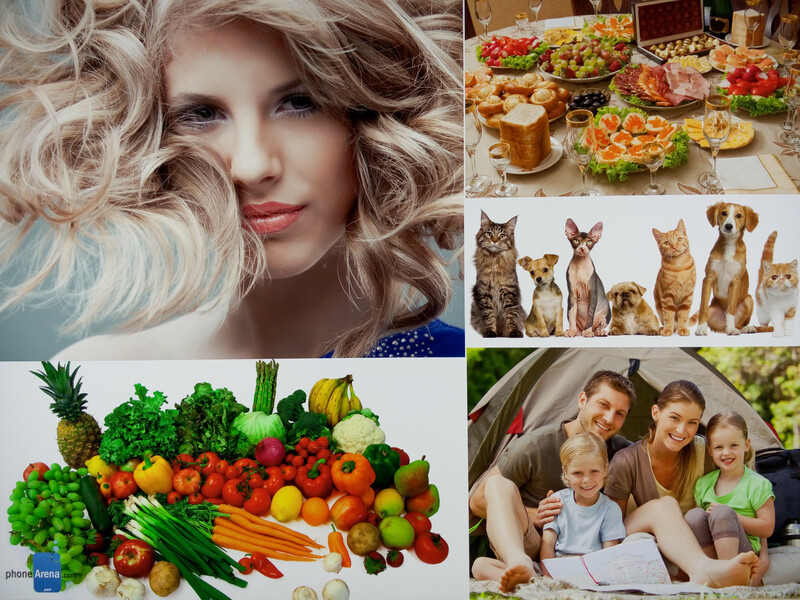 As for Live HDR, we can't quite figure out the idea behind it – it again reveals detail in dynamic scenes that we otherwise wouldn't see and processing time is almost non-existent in comparison, but images come out faded-looking, with impotent colors. Thankfully, the available “Refocus” mode works as expected and allows you to focus on different areas of the scene later on. There's also a separate “Manual” mode, which lets you tweak variables such as focus, shutter time, exposure, and ISO. Last, but not least, let's talk about video. When it comes to features and footage quality, the Mi 4 is among the most impressive handsets on the market. You've got 1080p and 4K UHD capture at 30 frames per second, and both modes support HDR, which is great. There's also a time lapse shooting mode, and you can shoot slow motion video, too. As touched on, resulting quality is impressive – this is one of the few cameras that doesn't underexpose footage too much, clips are fluid and detailed, and HDR video is great as well. But when it comes to sound recording, things get real messy. We honestly hope that a bug in MIUI6 is causing audio to come out the way it does – with a ton of sound artifacts that nearly prevent us from hearing our own voice. This needs a hotfix, ASAP. The MIUI software on board comes with its own, skinned video and music player apps, both of which are bare bones – that is, if you exclude the fact that they're hooked up with Xiaomi's video service and Baidu's music one, respectively. The latter one allows you to stream music for free, but buffering speeds are generally long and the focus is obviously more on music from Asian artists. It also has to be mentioned that the video player was capable of playing back clips with various encodings and it also allows you to tweak the aspect ratio of the footage, along with brightness and volume. The music player's only extra perk is its built-in lyrics support. As for audio reproduction, it's nothing fancy, even for a smartphone. Sound fidelity is decent, but the speaker on the bottom is not particularly loud. 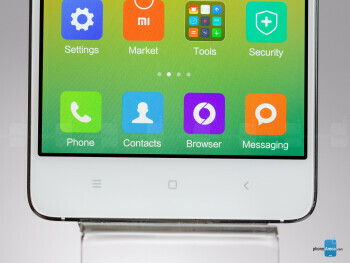 The Xiaomi Mi 4 is equipped with a noise-canceling duo of microphones – one nestled within the loudspeaker on the bottom, and another at the back, above the camera lens. The combo does a decent job isolating your voice from the background when on a call, but overall quality is only slightly above average. Indeed, while tonal information is preserved fairly well and the other side will hear you well enough at maximum volume, there will still be some distortion to your voice. As for the speaker, we found ourselves wishing that it delivered just a slightly higher volume – other metrics proved to be above average. If you happen to have a suction cup lying around, you'll be able to lift off the seemingly non-removable back cover of the Mi 4, under which you'll find the device's battery. 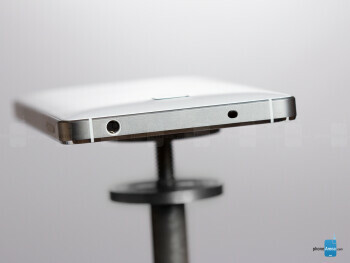 The 3080 mAh unit is quite generous, and our tests show that it is quite the performer, too. We already talked about Balanced and Performance modes earlier, so bear in mind that the test was carried out in the default (Balanced) mode the device comes in. Anyway, the Xiaomi Mi 4 clocked the excellent 8 hours 32 minutes on our custom battery life benchmark, which puts it alongside some of the all-time highest-scoring devices we've tested. It's still behind heavyweights such as the Sony Xperia Z3 and the Motorola DROID Turbo, but ahead of the likes of the Samsung Galaxy S5, the HTC One M8, the Apple iPhone 6, and the LG G3. The juicer is also fairly quick when it comes to regaining its charge – it needed 126 minutes to go from zero to 100% when using the wall charger provided in the box. Originality might not be Xiaomi's strongest suite, but execution sure is. This much has been made perfectly clear through the Mi 4 – a device that doesn't score perfect on each and every test, but nevertheless has ensured itself enough leeway through its affordable price tag. Indeed, the fact that the Mi 4 costs the equivalent of just $320 for the 16GB versions means that, even through scalpers, you can get the handset for less than $400, which is far less than you'll have to whip out for a flagship from an established Western brand. Does this mean that the Mi 4's only saving grace is its pricing? Absolutely not, though it certainly helps. And why shouldn't it when you can literally get two of those for you and the missus for the price of a Samsung Galaxy Note Edge? 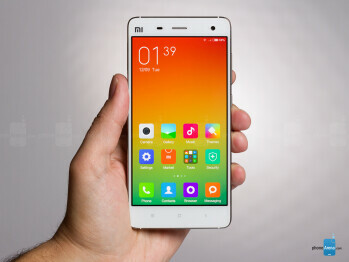 In fact, if it weren't for the Mi 4's Achilles' heel, the rear camera and its lack of LTE, we'd have a hard time justifying anything less than a chart-topping score for the Mi 4 – it's superbly-crafted, has an attractive, speedy and feature-filled interface, and can last you for two days straight. In the end, the Mi 4 is, at worst, good enough for just about anyone on the planet, and that ought to give Xiaomi the confidence that it can come up with its own original designs and not borrow as heavily from Apple and others. Once it figures that and irons out a few details, the West will be ripe for the taking, granted that it sticks to the same formula.